The Garden of Eden Signature 3 Wick Candle will fill your home with a bouquet of a blossoming exotic garden, blending tuberose, lily of the valley, jasmine and ylang ylang essential oils and fragrances. Hand-poured in England by luxury candle makers Charles Farris who have been hand-crafting candles in the heart of the city of London since 1845 and hold a Royal Warrant to Her Majesty the Queen. 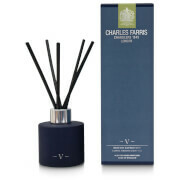 The candle is made from premium quality wax with three wicks to add a sumptuous statement to your room. Housed in a textured glass vessel and presented in a branded gift box, it will make a stunning home scenting gift.